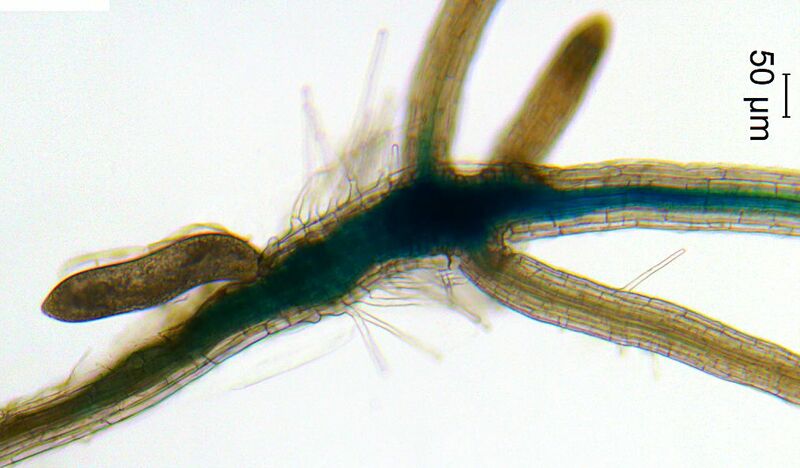 A nematode, the oblong object on the left of the nematode, activates the vascular stem cell pathway in the developing nematode feeding site, or the syncytium, on a plant root. COLUMBIA, Mo. — Invisible to the naked eye, cyst nematodes are a major threat to agriculture, causing billions of dollars in global crop losses every year. A group of plant scientists, led by University of Missouri researchers, recently found one of the mechanisms cyst nematodes use to invade and drain life-sustaining nutrients from soybean plants. Understanding the molecular basis of interactions between plants and nematodes could lead to the development of new strategies to control these major agricultural pests and help feed a growing global population. Soybeans are a major component for two-thirds of the world’s animal feed and more than half the edible oil consumed in the U.S., according to the U.S. Department of Agriculture. Cyst nematodes jeopardize the healthy production of this critical global food source by “hijacking” the soybean plants’ biology. About 15 years ago, Mitchum and colleagues unlocked clues into how nematodes use small chains of amino acids, or peptides, to feed on soybean roots. Using next-generation sequencing technologies that were previously unavailable, Michael Gardner, a graduate research assistant, and Jianying Wang, a senior research associate in Mitchum’s lab, made a remarkable new discovery — nematodes possess the ability to produce a second type of peptide that can effectively “take over” plant stem cells that are used to create vital pathways for the delivery of nutrients throughout the plant. Researchers compared these peptides with those produced by plants and found that they were identical to the ones the plants use to maintain vascular stem cells, known as CLE-B peptides. To test their theory, Xiaoli Guo, a post-doctoral researcher in Mitchum’s lab and first author of the study, synthesized the CLE-B nematode peptide and applied it to the vascular cells of Arabidopsis, a model plant system used in plant research. They found that the nematode peptides triggered a growth response in Arabidopsis much in the same way as the plants’ own peptides affected development. Next, the team “knocked out” the genes Arabidopsis plants use to signal to their own stem cells. Here, the nematodes didn’t do as well because the parasites were unable to signal to the plant and the nematode’s feeding site was compromised, Guo said.